Size matters when I am packing two books for a trip into the big city. My purse can only hold so much. I grabbed my copy of Kitty Takes a Holiday along with my husband's current book, The Dead Man's Brother by Roger Zelazny, and carefully tucked them into the open pocket of my purse. And off we went. I intended to read on the hour and a half to two hour drive into Los Angeles, but I was too interested in singing along to the Grease theatrical soundtrack (yes, I'm one of those people who likes to sing in the car). Taking our seats with a half hour before the start of the show, my husband and I decided to break open our books. Reading is a great way to pass the time while waiting as I am sure many of you know. It also makes those 15 minute intermissions go a little faster. We could have chatted amongst ourselves, eavesdropped on the conversations around us, or spent the time staring off into the crowds. We've done all of those things at some point in our musical watching experiences, and we will likely do them again in the future. This time, however, we were both in the reading mood and more interested in getting back to our books. The only downside is having to tuck them away again when the theater goes completely dark, sometimes with just tone paragraph to go until the end of the chapter (which happened to me last night). Other places you may catch me reading while waiting are before an appointment, in the drive-thru line, at the gas station while my husband pumps the gas, at the movie theater before the movie begins, inside the car while my husband runs into the game or manga store for a quick peek, and sometimes in line at the post office. Often, these stolen reading moments are very brief. I used to try and read during commercials while watching television, but since the invention of the DVR, I no longer watch commercials but fast forward through them. It's really for the best though. I often would get so engrossed in my book during the commericals that I would forget to start watching television again when the show was back on. What about you? Where can I catch you reading while waiting? It has been awhile since I last visited with Kitty Norville, werewolf radio talk show host extraordinairre. I first began reading Carrie Vaughn's series a few years ago, during the early years of my growing interest in the urban fantasy/paranormal genres. Laurell K. Hamilton was one of the first authors I tested in that genre, and she, along with Charlaine Harris and her Southern Vampire Series (which I still can't bring myself to call by its "new" name even though I am a fan of the television series) sold me on the idea of not only vampires, but werewolves too. Kitty was among the first werewolf heroines I came to love; Elena from Kelley Armstrong's Women of the Otherworld Series being another. I am not sure what it is about the hot blooded beasts I find so interesting. 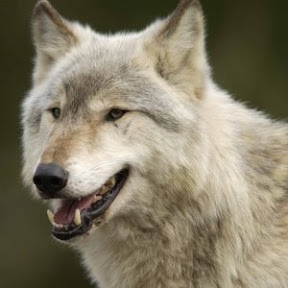 I have always been fascinated by real life wolves: their strength and beauty. There, of course, is something very dangerous about them as well. I tend to be picky about the types of books in this genre I will read. Heavy romantic plotlines often bore me (there are always exceptions), and so I tend to gravitate more towards those books that have a mystery or thriller slant to them, with the romance on the side if it is there at all. Does that make me more of an urban fantasy reader than a paranormal one? I admit to being a bit confused by the entire urban fantasy/paranormal distinction. I had not meant to go off on such a tangent, but sometimes my thoughts wander in unexpected directions. It is time to pull myself away from the computer and spend the rest of the morning reading. Be sure and stop in tomorrow for my review of Watchmen, both the graphic novel and the movie. I would echo all of the places you listed as my reading opportunities. I also read or listen while I am getting ready...it is a talent to blow dry and style my hair while looking somewhere else! I take my audio books everywhere I can't hold a book and read...when I'm mowing the yard, cleaning the pool, cleaning house, driving the kids around. My favorite time to read is when the kids have golf practice. I plunk down on a chair in the shade, and have 1 1/2 hours of uninterrupted reading. A lot of times you can find me sneaking in a few pages here and there in the same places as you. I also read while blow drying my hair, while working (when the students are doing silent reading), waiting for something to cook, if I get stopped by a train while driving, etc. I hope you enjoyed the musical! I love Grease! I alwaysalwaysalways carry a book with me, and I sneak in a little reading time whenever possible. I read on the bus to and from work. I read on my breaks. I read while I'm waiting for an appointment with my doctor, dentist, optometrist, etc. If I'm in a particularly long line, I whip out my book and squeeze in a few pages. I read before the lights go down at the theatre, then again at intermission. If I'm really, really absorbed in my book, I'll read during commercials, but that doesn't happen too often. Most of the time, I find the television too distracting. I always have a book in my bag. My best places to read are in the car waiting for my kids to come out of school and in the park whilst the kids play. You'd catch me reading in all those situations too! Those stolen reading moments can be frustrating - especially when, as you said, we're interrupted at a crucial moment in the book - but hey, they do add up. I read in waiting rooms, during TV commercials, in the drive-through line at the bank or McDonald's, pretty much everywhere that I can. I used to be able to read in the car (as a passenger) but recently that's been making me feel a bit carsick. Instead of reading a book in the car, I now bring along my iPod and listen to an audiobook instead. You can catch me reading everywhere: at the bus stop, on the bus, while I'm in class waiting for it to start. My favorite place to read is at my kitchen table with a cup of coffee next to me. Your list of places that you read while waiting sounds pretty much like mine. I've read in the stands before baseball games and in my car while it goes through the automatic car wash. But now that my eyes are getting older, it's tougher for me to read in theaters before the show unless my seat is near a light. I've found that I can read as a car passenger as long as it's cloudy outside, but I often wish I could make my commute by train - just think of all the extra reading time! I'm one of those people who sing in the car too :-). Hope you had a great time at the show! I always take a book with me wherever I go - especially at the beauty salon :) Right now, I'm planning on a vacation next week so I'm taking a stack to put in my suitcase. I always have a book in my bag, well because you won't know when you'll get stuck in a queue or anything! I hope you've a great week ahead, Wendy! Hope you guys had fun at the show! I read while queueing at the ATM machine, at meals, in the ladies (for 'long businesses'), well, actually, almost anywhere. I read in the car while I'm waiting to pick up The Girl from school. I also have my book on the kitchen counter and read while cooking...which accounts for at least 2 pot-boiler disasters. I'm sure I've been seen at a red light or two reading the last sentences of a chapter or book. I can also be seen almost every morning in my car in the parking lot reading a few pages before heading up to the office. LOL--not at a musical, though. :) Looking forward to hearing what you thought of Watchmen! Grease was wonderful. I really enjoyed it. Memory - I wish I got breaks at work (well, I do, but I never take them). I do try and read during my lunch break at least, but that isn't always possible. Nymeth - You are right; they definitely add up. Ruth - I hope that's not a sign of growing old--getting carsick. The way my husband often drives in city traffic, reading is a must to staying sane. That or sleeping. Haha! N. Vasillis - My favorite place to read is in bed, stretched out. :-) The couch is pretty cozy too. Sometimes the lighting in the theaters can be bad, I agree. And I'm with you about sometimes wishing I commuted by train for that very reason. Yvonne - Oh, yes! I do that too. I like to read while getting my hair colored. It's been such a pleasure returning to Vaughn's world. I hadn't realized how much I needed a quick and easy read until I started reading it. I hope you have a good week as well! Iliana - We had a great time. I'm trying to talk my husband into sneaking in Dirty Dancing in May, but I'm not sure he's interested in that one. Reading while waiting for the car to be serviced is a big one. And jury duty. I forgot about that one. Alice - Me too! I even sometimes read while playing fetch with my dog. Isn't that horrible? Riley doesn't seem to mind. Karen - It's so easy to get lost in a book and forget what else you are doing, isn't it? Reading While Waiting...I read at the Balbao Movie Theater in my neighborhood while waiting for the movie to start. This is a great little theater, none of those horrific half-hour ads for designer handbags and television shows--so it's really a peaceful place to read. I sometimes read while in line for my coffee at the cafe, but this makes me feel antisocial. I read at the DMV, when I'm so unfortunate as to have to go there. But I don't have Sandy's talent of being able to read while getting ready. My sister used to do this when we were kids, though, and still does. I liked Kitty Takes a Holiday of course but it is my least favorite in the series. I'm one of "those" people too (except my Grease soundtrack is on record lol). I'll read anywhere and everywhere lol, I can't stand to just be idle! I just finished and enjoyed Kitty Takes a Holiday. I find that I really enjoy urban fantasy more and more :) I read during commercials sometimes too! And whenever else I can sneak in a chance. Wendy, I wish I could read anywhere. I get easily distracted especially if the people watching is good. Don't worry about getting off on a tangent. I either have a lot to say or absolutely nothing it seems;-) I have to take advantage when I can. I've been guilty of reading during commercials and missing out on parts of the TV show I'm watching! We have yet to invest in a DVR (must do soon though), so there are times that we are TAPING one show and watching another real time and so must deal with commercial breaks. Michelle - Thank you so much for stopping by, Michelle! I am envious of your Balbao Movie Theater. I wish the local movie theaters I frequent would follow its example. Those ads really are annoying. I have difficult reading while getting ready too. Although I can read while brushing my teeth. Jen - I am reading Kitty and the Dead Man's Hand right now. It's a fun series. Kristy - Haha! I do know what you mean. That happens to me when I'm waiting in the airport. I have trouble concentrating on my book and end up watching the people instead. I hope you have a great weekend! Terri - You too, eh? It's just so easy to do! Since we subscribe to cable, it comes with a DVR automatically. For the longest time, we'd have both our TV's going, VCRs recording different TV shows at the same time. It's nice not having to worry about that so much anymore. Carrie K. - And it's best not to waste those few minutes! I have been disappointed too when not made to wait a little longer for an appointment.